Fresh produce company Andrew Williamson Fresh Produce, has announced that it is expanding the scope of its earlier product recall. Although the quantity of the recalled grape tomatoes has not changed, the number of states where the recalled tomatoes were distributed has increased. 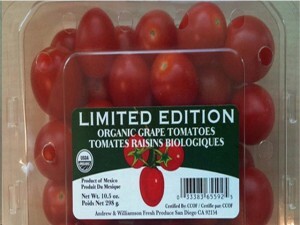 Andrew Williamson previously announced that it was recalling its grape tomatoes because of possible Salmonella contamination. Originally, the tomatoes were thought to have been distributed to only 18 states in the country. However, the company now is extending the recall to all 50 US states. The recall also extends to Canada, as the original recall announcement has stated. The recall was issued by the company as a precautionary and safety measure, as one clamshell of this limited edition product was found to be contaminated by the Salmonella bacteria. The contamination was discovered after a random sample testing made by the state of Michigan’s Department of Agriculture. The organic tomatoes were sold packed in 10.5-ounce “clam-shell” plastic containers. The recalled lot has a UPC code of 033383655925, which can be found on the front part of the packaging, just under the barcode. The clamshell containers also have a print that states that the product is a “Limited Edition” and is a “Product of Mexico.” These tomatoes are being sold under the Fresh & Easy label. Salmonella is a harmful bacterium that can cause serious health risks to people. In worst cases, a Salmonella infection can lead to death, especially in children, elderly people, those with existing medical conditions, or those with weakened immune systems. Customers with concerns or questions about this recall can call the company at 1-619-661-6000, from 8 AM until 5 PM, Pacific Standard Time. ORGANIC ? How can that be ?